Good times from the early days of local commercial radio in the UK. 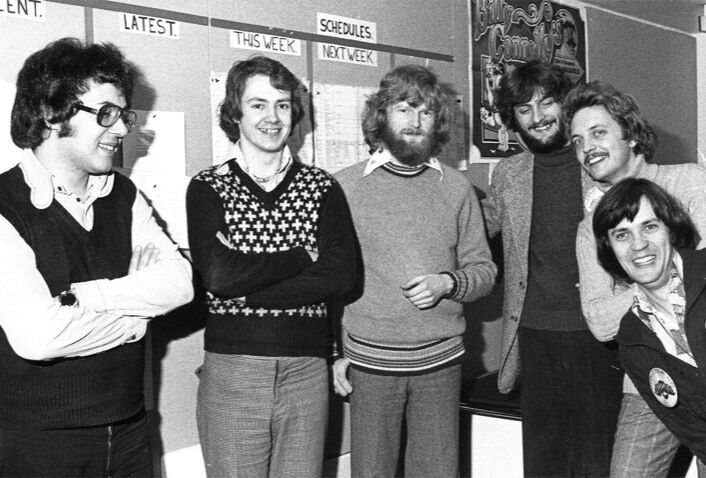 Radio Tees in the North East of England - I joined just before the station came on air in June 1975 and left at the end of 1981 to join Moray Firth Radio in Inverness, Scotland. Hope to add captions to these photos soon but the program I use won’t let me. Photos are mainly mine with some from John Foster - BBC Radio Tees + BBC Radio Sheffield. We should ALL thank John for his fantastic and genuine interest in Radio Tees and for what he does to keep these memories alive! There is more audio to come too. A few Radio Tees programmes…..
My second to last Radio Tees Breakfast Show. I am……. always have been….. and always will be….. a night time person. I HATE getting up early and NEVER wanted to do the bloody breakfast show!!!! Although I quite enjoyed the weekend ones. Boris the boss put me on the Breakfast Show when the existing presenters wife threatened to leave him unless he came off it!! I spent over an hour in his office going over it link by link until I was so confused I could hardly think straight. Then he took me off and put me on throughout the night plus weekend breakfast shows….. I will write more about this. RIP Bob Hopton….. in some ways a real bugger but in other ways a fantastic guy who BELIEVED in it in a way that people in Radio today are incapable of understanding and I will be forever grateful for having worked UNDER him and for the opportunity he gave me. My Radio Tees Audition tape! !